Oxford. Pages 280. Rs 2,500. As histories go, this is a short one, considering that Guru Nanak Dev, the founder of Sikhism, was born less than five and a half centuries ago. It has been chronicled several times, notably by the late Dr Hari Ram Gupta. However, the most popular account has been Khushwant Singh's A History of the Sikhs, which was first published almost three decades ago. Khushwant Singh has updated this account now and given it a visual twist too. So, readers have an illustrated version, which is up-to-date, right up to the references to Prime Minister Manmohan Singh, who released it in New Delhi last week. But, what does one say about the work on which Khushwant Singh's reputation as a historian rests? Like all his books, it reads well. Khushwant Singh does not burden the reader with details. He has a remarkable felicity of expression that sweeps the reader onto a journey that covers the geography, climate, landscape, flora and fauna, and, above all, the people of Punjab. The over 150 photographs add a graphic element to the book, though the selection is not consistent and, given the cost of the book, many more colour illustrations would have ensured full value for money. The author examines the important elements in the Sikh religion and the society that it flowered in. The lives, teachings and contributions of the 10 Gurus are summed up in pithy essays that cover a lot of territory, as is evident in a chapter on the building of the Sikh church. The call to take up arms came after the Guru Arjan Dev, who built the Harmandir Sahib or the Golden Temple, and gave the Sikhs the Guru Granth Sahib along with many mellifluous compositions, including the Sukhmani, was killed by Emperor Jehangir. The Granth became the Guru after Guru Gobind Singh ordained it to be so. Colourful as well as valorous personalities from the annals of history like Banda Bahadur who shook the Mughal kingdom in seven years; Baghel Singh, who entered Delhi but did not rule it; Maharaja Ranjit Singh, the Emperor of Lahore, all come alive on these pages. 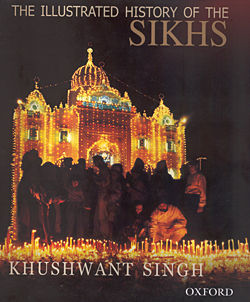 Khushwant Singh also covers the religious movements—including the Nirankaris. He does not maintain a distinction between the Nirankaris, a reform movement led by Dayal Das, and the Sant Nirankaris, a different faction started by Baba Avtar Singh in 1929. "The present head is Hardev Singh, the son of Hara Singh." Actually, Hardev Singh, the head of the Sant Nirankaris is the son of Gurbachan Singh, who was assassinated by militants in 1980. Later, while discussing the Radha Soami movement, he refers to Charan Singh (who died in 1990) in the present tense. His successor is his nephew, Gurinder Singh Dhillon. Chronicling contemporary history is always difficult and this is one task that Khushwant has accomplished with `E9lan. He was very much a part of British India. His father, Sir Sobha Singh, had a role in building Delhi, and the author has been closely observing the events as they unfolded before him—the Raj, Independence and the post-Independence turmoil. Remarkably, since the events are so near, both in time and emotional, the author manages to be objective as he takes the reader through the last century. One could debate a detail here or pick a bone there, as one has, but the author has done a remarkable job of dealing with the tumultuous phase of the Partition, the reorganisation of Punjab, the Green Revolution and the Naxalite movement. Many readers would be interested in the author's analysis of what Prime Minister Manmohan Singh called the "dark period" of the 1980s. Khushwant Singh’s position in the book is consistent with his writings in various newspapers. He is even-handed in apportioning blame to the Congress, the militants and the Akalis, as well as other small players. This is a period that best belongs to history books now. The Sikhs have moved on. In fact, the community has much to be proud of, including this erudite, opinionated, blunt and, at times, loud man of letters it has produced. But then, he epitomises the body politic that he has so successfully chronicled.